This was the quilt ready for the binding to go on. Here is a close-up of one of the blocks. I used straight line quilting on the bars on either side of the maple leaf and meandering quilting around the leaves. The leaves are appliqued on using Heat n' Bond light and then machine stitched in a zig zag with matching thread around the edges. These are the quilt blocks laid out on the floor ready to be sewn together. This is the finished quilt with binding on, washed and ready to be mailed to a Canadian soldier. This quilt was mailed out in March of 2014. It was a lot of work but a true honour to be able to gift it to someone who needed a boost and who needed to know their work and sacrifice has not gone unnoticed or unappreciated. I pieced and quilted this quilt myself. The pattern is "Oh, Canada" by Cheryl Arkinson. The binding is machine sewn to the front and hand sewn to the back. 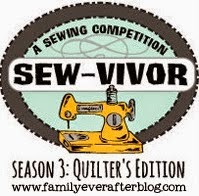 I am looking forward to seeing how the competition plays out and seeing everyone's quilted creations. Head over to the Family Ever After blog to have a read through the rules and challenges and decided if you want to throw your hat in the ring for this one. The prizes are out of this world!